Barcelona have also set up a remembrance space at the Nou Camp, which players and over 50,000 fans have already visited. Former Barcelona manager Tito Vilanova has been remembered at a ceremony following his death at the age of 45, with the club's players in attendance. 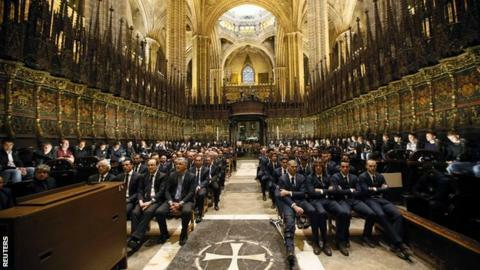 The entire first-team squad, along with Vilanova's family and figures from the world of football, attended the ceremony at Barcelona Cathedral. Barca president Josep Maria Bartomeu paid tribute to "a very loved person". The former Barca youth-team player was Pep Guardiola's assistant manager for four successful years, before succeeding him in 2012. Vilanova, who had a tumour removed from his throat in November 2011, suffered a relapse in December 2012. He returned to his job in March 2013 in time to see them win the title, but resigned that July to continue his treatment.